The Big Island, is nearly twice the size of all the other Hawaiian islands combined. Geographically it's the most diverse island of the archipelago, with deserts, rainforests, volcanoes and, surprisingly, snow-capped mountains. The mountains create a huge barrier that blocks the north-easterly trade winds and makes the leeward, western side of the island the driest region in the archipelago. This coast has the best beaches and water conditions. The windward, eastern coast is predominantly rugged, with pounding surf, plenty of rain, tropical rainforests, deep ravines and majestic waterfalls. Kona, Waikoloa and Hilo are the main centres for accommodation and restaurants. The Hawaii Volcanoes National Park is hands down the most unique park in the US National Parks system. It covers a huge area and encompasses two active volcanoes, a still-steaming sunken crater and geologically awesome landscapes of cinder cones, pumice pillars and hardened rivers of lava. Its terrain ranges from tropical beaches to the subarctic summit of Mauna Loa, and includes lovely rainforests and fern groves. This is one of the best areas in Hawaii for camping and hiking. The lush, coastal Waipio Valley is the largest and most spectacular of the series of amphitheatrer valleys on the windward side of the Kohala Mountains. It is enclosed by near-vertical high cliffs and is accessible only by a narrow, excessively-steep 4WD track, making hiking in the best option. The valley is a fecund tangle of jungle, flowering plants, taro patches and waterfalls, and a magical place to experience the spirit of the 'old' Hawaii. The valley has one rustic hotel, some 50 residents, a number of wild horses and a few aggressively territorial farm dogs. The great thing about Hawaii is that each island is different from all of the others. Kauai is the oldest of the main Hawaiian Islands and thus has the densest rain forests, the deepest canyons and the most stunning sea cliffs. It is nicknamed the Garden Isle and you'll see amazing flowers almost everywhere. Here are our sightseeing tips for a first time visitor to Kauai. Places of interest include the stretch of sharply fluted coastal cliffs along Na Pali Coast. This is the locale of Hawaii's most spectacular hiking trail, with sheer, green cliffs dropping into brilliant turquoise waters. Waimea Canyon - predictably dubbed the 'Grand Canyon of the Pacific' - is smaller and a mere 200 million years younger than its Arizona cousin, but otherwise not at all dissimilar. The canyon's colourful river-cut gorge is 835m (2785ft) deep and it seems incredible that such an immense canyon could be tucked away in such a small island. There's a beautiful, endless sandy beach at Polihale on the western coast, not far from the brilliantly named US naval base, Barking Sands Pacific Missile Range. The area is almost a desert, so when it's raining everywhere else, beachgoers head this way. Lumahai Beach, in the north, is the gorgeous stretch of beach where Mitzi Gaynor promised to wash that man right out of her hair in the 1958 musical South Pacific. It's a broad beach sandwiched between lush jungle on one side and tempestuous ocean on the other. A trip up the Wailua River to the Fern Grotto in a tourist cattle barge is a must for anthropologists, absurdists and those who love to holiday to the sounds of Elvis' Hawaiian Wedding Song. More than likely if you're staying on Maui, you're probably staying either in West Maui or in one the resorts on the Kihei and Wailea Coast. There are many attractions in West Maui to keep you busy, most of which are in the old whaling town of Lahaina. Lahaina is probably the second most famous town in Hawaii, second only to Honolulu. Lahaina served as capital of the Hawaiian Kingdom from the early 1820's until 1845. The 1840's saw Lahaina as the major whaling port of the Pacific. The whaling ships and whalers are long gone, and today's Lahaina is both a bustling shopping mecca as well as a city steeped in the culture of old Hawaii. The Valley Isle is aptly named because of the two volcanoes which lie on either side of a lush interior valley. Bordered by the West Maui Mountains to the west and Haleakala to the east, Central Maui is home to Maui's largest town, Kahului and its neighboring town of Wailuku. It's also the home to Kahului Airport where most visitors arrive in Maui. The Bailey House Museum is filled with period furnishings, artifacts and art. The coast of South Maui from Ma'alaea to the `Ahihi-Kina`u Natural Area Preserve is often referred to as the Kihei Coast. In fact, however, the most interesting areas of this coast are located south of Kihei. The island's 112 miles of coastline is graced with more than 130 beaches, strands of golden sand that slope gently into the sun-sparkled, sapphire-blue water of the warm Pacific. Since the waters off Oahu are unpredictable, people are urged to swim at guarded beaches. Assuming you're in Waikiki, you'll find a 2-mile string of a dozen beaches just outside your doorstep. They stretch from the Ala Wai Yacht Basin to Diamond Head and are known as Kuhio, Sans Souci, Gray's and Kahanamoku. Ala Moana Beach Park, just west of Waikiki, is a favorite of local residents. Another popular South Shore beach is Hanauma Bay Nature Park on Kalaniana'ole Highway just past Hawaii Kai in East Honolulu. Oahu is home to Honolulu, the biggest city in Hawaii; Waikiki, the Pacific's leisure-and-pleasure capital; some of the world's biggest surf; evocative WWII memorials at Pearl Harbor, and a relaxed multicultural mix that gives a memorable flavour to its streetscapes and restaurants. Away from the main urban areas, there's little to distract you on the island's makai (ocean side) except for long tracts of white sand, exhilarating surf, the sweet smell of the ubiquitous hibiscus and the endless greetings from islanders shaking their shakas. If Hawaii's sweet-smelling flowers and trees have captured your fancy, you'll be happy to know that Oahu offers plenty of botanical gardens where you can't help but bliss out. Foster Botanical Gardens, a verdant oasis on the edge of downtown Honolulu, is filled with acre upon lush acre of the nation's largest collection of tropical plants. And it's home to 43 of Oahu's designated "exceptional trees," which are protected by law. The collection includes labeled plantings of palms, heliconia, orchids, and a primitive cycad garden. The gift shop has packaged plants and seeds that are cleared for entry into the Mainland as well as plant-related gifts and crafts. Lyon Arboretum, a 124-acre research center tucked back in the moist, verdant Manoa Valley just 10 minutes' drive from Waikiki, is home to more than 5,000 tropical plants, some of which can be purchased. Guided tours, on Tuesday and Saturday, are conducted for $2.50 and there's a nearby hiking trail to Manoa Falls. Hanauma Bay, in southeastern Oahu, is a wide, sheltered bay of sapphire-and-turquoise waters set in a rugged volcanic ring. It has fantastic coral and marine life and wonderful snorkelling, but it's under environmental pressure from the sheer number of visitors coming to feed and view the fish. The Nuuanu Pali Lookout, in the southern Koolau Range, has brilliant views of the windward coast. This is where Kamehameha the Great routed Oahu's warriors during his invasion of the island in 1795. Hawaii's most visited attraction is the USS Arizona Memorial at Pearl Harbor, north-west of Honolulu, where 1.5 million visitors come each year to learn about the surprise Japanese attack on December 7, 1941, and to pay their respects to the 2335 dead US servicemen. 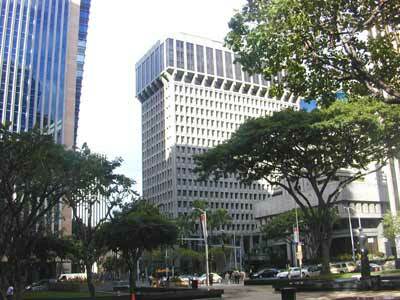 A short walk from the State Capitol in downtown Honolulu is the seat of Hawaii's former government. Built in 1882 for King Kalakaua, 'Iolani Palace is the only restored royal palace in the United States. Until 1893 when the United States government overthrew the Hawaiian monarchy, this Renaissance-style building was the official residence of King Kalakaua and Queen Lili'uokalani, Hawaii's last two monarchs. Following the overthrow, the palace was stripped of its furnishings and used by territorial and state governments as an executive building. In 1969 when the State Capitol was completed, the Palace was vacated and Friends of 'Iolani Palace began a $7.5 million restoration of the building. During the 76 years the palace was used as a government building, more than 10,000 artifacts were sold at auction. About 4,000 of them have been recovered. Aloha Tower is famous for greeting all who arrive in the port of Honolulu by ship. Recently restored, you can take an elevator to the top and get the best views of Honolulu and the surrounding area. The Bishop Museum is a must see for anyone interested in the history and culture of Hawaii. The museum contains the world's largest collection of Hawaiian and Pacific artifacts. The museum is not within walking distance of downtown or Waikiki, but there is plenty of free parking available and public transportation does service the museum. The heart of Chinatown is along Maunakea St around N King and N Hotel Sts. Head south on N Hotel St and you'll be treated to a tour of Chinatown's seamiest side, with peepshows and nudie bars sporting evocative names like Club Hubba Hubba. Heading north on N Hotel St you come to Wo Fat, a big pink restaurant shaped like a Chinese temple at the corner of Maunakea St. The River St Pedestrian Mall, three blocks north of Wo Fat, is lined with food stalls and old men playing mah jong and checkers. Towards its eastern end is a Taoist temple and, just across Nuuanu Stream, a Shinto shrine. Respectful visitors are welcome in both. At the eastern end of the pedestrian mall on Chinatown's northern boundary is a former royal estate that now houses the city's finest greenbelt, the Foster Botanical Garden. Near the entrance is yet another worship spot, the ornate Buddhist Kuan Yin Temple. The main entrance to Chinatown is the Chinatown Gateway Plaza at S Hotel and Bethel Sts, five blocks north of Iolani Palace. Diamond Head is a tuff cone - a hill composed of compacted volcanic ash - formed by a violent steam explosion deep beneath the island's surface long after most of Oahu's volcanic activity had stopped. Its peak provides a majestic backdrop to the flair of Waikiki. The Hawaiians called the hill Leahi, and at its summit they built a luakini heiau, a type of temple used for human sacrifices. But ever since 1825, when some British sailors noticed calcite crystals sparkling in the sun and quickly mistook themselves for rich men, the hill's been known as Diamond Head. The best reason to visit Diamond Head is to hike the trail to the crater rim, where those who persevere are treated to a showstopping 360° panorama of the entire southeastern coast of Oahu. Nestled on a quiet forested mountain slope above the hustle and bustle of Honolulu is The Contemporary Museum. Called TCM, this is an important cultural resource in Hawaii. Installed in what was once the home of Anna Rice Cooke, acres of Zen-like oriental gardens with views of Diamond Head allow for quiet contemplation after a walk through the six galleries. Exhibits feature international contemporary art of the last four decades. Hawaii's contemporary artists share equal prominence in the museum's programs and exhibitions. The small but fascinating Damien Museum and Archives, at the back of St. Augustine's Catholic Church in Waikiki, chronicles the life of the Martyr of Molokai. Just 3.2km (2mi) from downtown Honolulu, a switchback road cuts its way through the lush forest reserve land of the Makiki Valley to the top of Mt Tantalus. A continuous circuit, the western stretch of the road is called Tantalus Drive and the eastern portion is Round Top Drive. As a loop, it offers the finest views of Honolulu available without wings. Winding past some of the city's swankiest mountainside homes, the well-paved route meets up with several trails leading into the Honolulu Watershed Forest Reserve and Puu Ualakaa State Park. Surprisingly, the only walking most people do here is between their car and the scenic lookouts. Bring your hiking boots along, and you may well have the whole trail to yourself. Nestled at the base of Makiki Valley, just off Tantalus Drive, you'll find the Contemporary Museum, a quality modern art showspace on an estate surrounded by woodsy gardens. A new building on the lawn holds the museum's prize possession, an installation by David Hockney based on his sets for a Ravel opera. The galleries feature changing exhibits of national and international artists. Although daytime is best for hiking and taking photos, the upper reaches of the valley also offer great spots to watch evening settle over the city. The museum can be reached by bus from downtown Honolulu, but to get to the mountaintop you'll need a car. The largest tourist destination in Hawaii, Waikiki is a long stretch of picture-perfect white-sand beach just southeast of downtown Honolulu. Its shores are lined with swanky high-rise hotels set against the scenic backdrop of Diamond Head. On any given day, the tiny area is thronged with package tourists from Japan and North America: 65,000 of them on average, in addition to some 25,000 residents. It boasts more than 30,000 hotel rooms; close to 1000 restaurants, bars and clubs; and more shops, shams and shysters than anyone cares to count. If you've come to Hawaii for the luaus, hula lessons and lazy days on the beach, you'll hit the motherlode in Waikiki. But independent travellers needn't be discouraged - if you're one of those with less packagable predilections, you'll be happy to find activities such as outrigger canoe clubs and Japanese tea ceremonies to distract you from the masses. And there's always the natural beauty of the area, with its spectacular orange sunsets, bath-warm waters and night skies overrun with stars. The stretch of white sand that runs from the Hilton Hawaiian Village to Kapiolani Beach Park is commonly called Waikiki Beach. Although it teems midday with beach boys and betties, sunrise strolls here are downright meditative. By midmorning, the surfers, sailors and swimmers begin to amass, and by noon it's a challenge to get to the water without stepping on somebody. Fronting the Hilton, Kahanamoku Beach is one of the calmer swimming areas, ironically named after one of Hawaii's wildest native sons, Duke Kahanamoku, a local swimmer and surfer who won the 1912 Olympic 100m freestyle. At the southern end of Waikiki Beach, boogie boarders cluster at Kapahulu Groin, delighting onlookers with their daredevil wave riding. Waikiki's Hawaiian-style entertainment ranges from Polynesian extravaganzas, with beating drums and hula dancers, to mellow duos jamming on ukuleles or slack-key guitars. Duke's Canoe Club is the most popular venue for contemporary Hawaiian music, while any of the big resorts can provide you with the other stuff. The area around the hotels is the best place to look for nightclubs and bars. Honolulu's gay scene is focused on the venues along Kuhio Ave between Kalaimoku and Kaiolu Sts. Waikiki has a rhythm and pace that will attract nightowls and singles who like to recover from their hangovers on a decent city beach. The Moorish, pink-turreted Royal Hawaiian Hotel is a survivor from the days when Rudolph Valentino was a romantic idol and people came to Hawaii by luxury liner. South-east of the city is Diamond Head, a tuff cone and crater formed by a violent steam explosion. Its high summit forms the backdrop to Waikiki, and is one of the best-known landmarks in the Pacific. It has a good hiking trail and there are fantastic panoramic views from the top. You might already have gone snorkeling and are curious about the multitude of life forms you observed below the surface of the mighty Pacific. You may have heard about the Hawaiian Monk Seal and want to see these huge endangered creatures for yourself. Perhaps you want to see sharks cruising back and forth while your feet are firmly planted on dry land. All of this and more is available at the Waikiki Aquarium. The Waikiki Aquarium was founded in 1904 and is the third oldest public aquarium in the United States. It is situated next to a living reef on the Waikiki shoreline. The focus of exhibits, programs and research is the diversity of aquatic, shoreline and coral reef inhabitants in Hawai'i and the tropical Pacific. Home to 2,500 animals representing 420 species, the Aquarium is especially proud of its reputation of excellence in coral reef exhibits. Pearl Harbor was originally known for its stocks of pearl oysters, which were eventually wiped out by mudslides from surrounding hills denuded by overgrazing. But as of 7:55am on the morning of 7 December 1941, this sheltered harbor on Oahu's southern shore became the geographical and emotional catalyst for the USA's involvement in WWII. Windward Oahu, the island's eastern side, parallels the Koolau Range along its entire length. The mountains looming inland show scalloped folds and deep valleys. There are some decent swimming beaches along the coast - notably Kailua, Kualoa and Malaekahana - but most are too silted for swimming.